Roland EGX-350 engraving machine is the perfect engraver for those making the transition into a production class engraver. Roland EGX-350 has the speed, durability, and finesse you can expect from a heavy-duty desktop engraving machine. The Roland EGX-350 engraver is capable of producing large quantities of custom gifts, awards, signs, and rhinestone apparel. You can also create high quality indoor ADA compliant signage while maintaining all ADA signage guidelines. Equipped with a 20,000 rpm DC brush less motor, the Roland EGX-350 desktop engraver produces an array of products with crisp text and clear graphics. 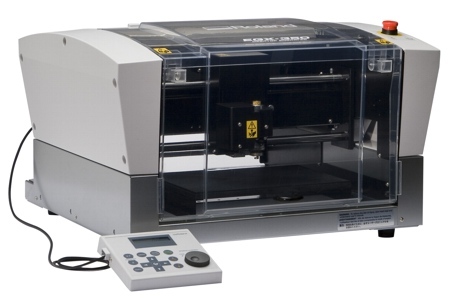 Roland EGX-350 engraving machine comes equip with a 12" x 9" work area which easily handles a wide variety of materials including: plastic, acrylic, aluminum, stainless steel, brass and wood. The optional center vise and T-Slot make it easy to secure objects of different sizes and shapes to the Roland EGX-350 for precision engraving. The available chip removal system makes cleanup a breeze and ensures your cutter is never obstructed by particles that may prevent it from continuing to make precise and clean cuts. Roland EGX-350 engraving machine creates beautiful custom nameplates and signs. Take your ordinary gifts, awards, and promotional items and transform them into treasured mementos by personalizing them with names, events and dates. 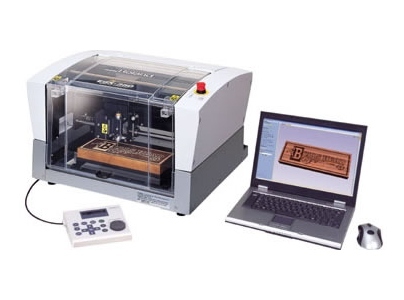 The Roland EGX-350 is ideal for engraving plaques and trophy plates. Equip with a special V-carving mode, the Roland EGX-350 generates a beautiful hand-carved look. In addition, the Roland EGX-350 engraving machine can even produce design templates for heat pressing rhinestones onto t-shirts, handbags and other apparel. In addition to versatility, Roland made the EGX-350 incredibly easy to use. A hand-held control panel with a large LCD screen lets you quickly select engraving options, such as spindle speed, without using a PC. 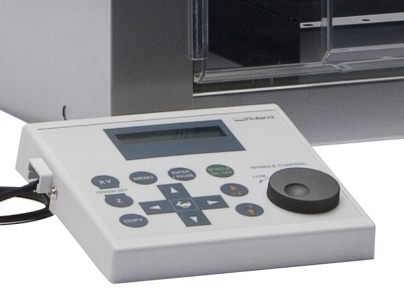 The hand-held control panel can be separated away from the engraving machine allowing you to start and pause a job from a safe distance and also incorporates a jog dial for making menu changes or adjusting the spindle speed on the fly. Roland EGX-350 engraving machine comes with an advanced surface detector setup which automatically determines the Z axis starting point when the tip of the nose guard touches the material surface. Its features like these that make working with the Roland EGX-350 engraving machine fast, simple, and easy. 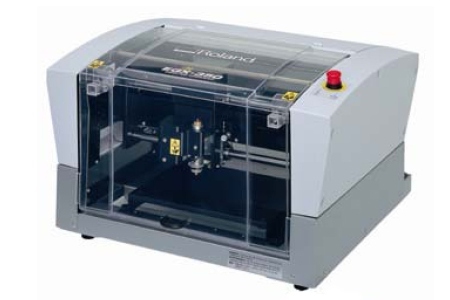 Roland EGX-350 engraving machine comes equip with Roland Engrave Studio software FREE of charge. Engrave Studio facilitates the production of a wide variety of jobs. With single stroke fonts and the V-Carving feature, Engrave Studio generates quality results from simple name plates to elegant wood signs and luxury stationary. Engrave Studio allows you to import designs in AI and EPS file formats, and lets users preview them, saving precious materials and time. Make sure to purchase the starter kit and adhesive hold down sheets to fully engage in all the possibilities the Roland EGX-350 engraving machine has to offer. Roland EGX-350 is the perfect engraving machine solution for you and your business to succeed. Danny is awesome....helped us select the right engraver as well as template setup....Jesse is the best teacher (for someone with absolutely no engraving experience he got me through)! My company recently purchased an engraver. The purchase was a turnkey setup. I received a video using one of my samples that walked me through the software. At that point I spent some time on the phone with one of the company reps who instructed me how to set up the machine. The machine is now engraving parts. The machine will be used in the future for some different kinds of engraving and I am confident I can get any help I need. Daniel and Jesse were great. I am a first time buyer and they were both very patient in educating me about the equiment. Excellent support after the sale. Great product. It was very easy to set up and begin engraving. Danny was very helpful in demonstrating the engraver prior to my purchasing one. Follow up support has been great as well. I would highly recommend them and their products. We purchased this machine for an operation that was originally done on a CNC mill. The engraving machine has been a valuable asset and very user friendly for our associates. We went from an operation that was taking about an our to setup and program on a CNC mill to the engraving machine which did the same operation in 15 minutes. I would highly recommend the purchase of this engraving machine not to mention the guys at engraving machines plus Daniel & Jesse are great to work with. This engraving machine has definitely been value added for our operation. Daniel and the team have done a great job setting things up and educating me for success. I hope to keep learning from them. In this day and age where customer service is non existent, you’ll find it at Engravings Machines +, now you know what the + stands for! Jesse is the “go to guy” when you need help, he goes beyond what you might expect for customer service! BTW, the EGX-350 is incredible! We did a lot of research to find the right engraver and the right company. We could not be happier with both the machine and the service we have received! Jesse Davis has been such a great help! Because I'm new to engraving, the help he offered me was immeasurable. I went from a total novice to someone who (within a week) feels comfortable using the machine and software all on my own! I'm so glad we found Engraving Machines Plus and had the opportunity to meet and work with Jesse. Engraving Machines Plus has provided exceptional customer support and education for me as I've learned how to use the engraver. Danny in particular has been a major help and I appreciate their promptness and professionalism. Thank you! My highest recommendation for this company. I offer my highest recommendation for Engraving Machines Plus. Danny and Jessie really exceeded my expectations. Danny took the time to listen to my needs for an engraver. He recommended the machine that balanced economical costs and functionality. Jessie provided me with excellent tech support. Together they provided me with the ability to increase production, and get started immediately. The phone training from Jesse was extremely helpful. He was able to set the engraver up remotely and trained us on the software within a couple of hours. The engraver has performed great so far. We received a lot of guidance and excellent followup from Danny Martinez during our purchase of an engraver. Everything was delivered promptly, and Danny's recommendations were on target for our application. We were up and running in no time. Easy to use for regular signs. Service was great, fast delivery and very helpful in getting the machine to work properly for our needs. Always available when needed help fast response every time and very friendly. Great machine and amazing customer service. They went above and beyond to help make sure the machine we wanted was right for us. Will be buying another soon and will go back to Engraving Machines Plus! Highly recommended! I researched many websites and engraving machine places before deciding to buy my EGX-350 Desktop engraver from Engraving Machines Plus and I am really glad I did. Jesse has been over the top helpful in getting me setup and running with the machine. He is patient and kind and always willing to help me out with different applications of the machine. Could not be happier with the machine or the customer service that I have received since purchasing the machine. Danny and Jesse have been great to work with. We decided to add engraving to our custom line of jewelry, and these two really stepped up with testing, training, and setup. We had never used an engraver before, and with their help were quickly up and running. I cannot emphasize enough how important it is to have the post sales training and support that these two offer. I would gladly recommend this company.